I try to avoid having processed foods at home and always get excited to make healthy snacks that I can eat on the run without the guilt. These low carb No-Bake Protein Blondies are really easy and fast to make, and are completely free of nasties commonly found in store bought protein bars. Gluten-free, sugar-free, and guilt-free! What else could you ask for? Oh…did I mention loaded with beneficial soluble fibre! Soluble fibre is important for maintaining a healthy digestive track, which is extremely important for successful elimination and can cardiovascular health because soluble fiber attaches to cholesterol particles and takes them out of the body, helping to reduce overall cholesterol levels and the risk of heart disease. You really can’t go wrong with theseNo-Bake Protein Blondies. The easiest way to make this recipe is by using a food processor. That is the quickest way to get the right texture. 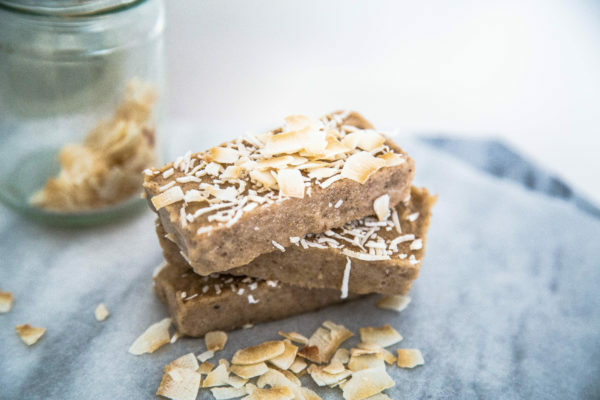 If you love these No-Bake Protein Blondies, don’t forget to leave a comment! Place all dry ingredients in a food processor and process until fine. Add the wet ingredients and combine until smooth. Place in a silicone loaf tin and pressing it down firmly. Sprinkle with coconut and place in the freezer until firm (at least 45 minutes). If you enjoyed this recipe you’ll love my Protein Peanut Butter Cups. They are divine, and only take a few minutes to make!